Hi everyone! I have swatches of the Celestial Cosmetics It's All Happening collection to share with you today. This is my very first time trying Celestial so see you after the jump for my thoughts on the brand! It’s All Happening is a collaboration collection with Christine from Serenity Nails that consists of 7 shades, shimmers, holos and flakies. Formula was nice on the entire collection, I used 2 coats plus topcoat in all of my swatches and didn't experience any issue whatsoever. Swill Merchants is a pale grey crelly with green shimmer and small flakies. Incendiary is a silver linear holo with silver flakies. You Are Home is a mint green crelly with rainbow and silver flakies. 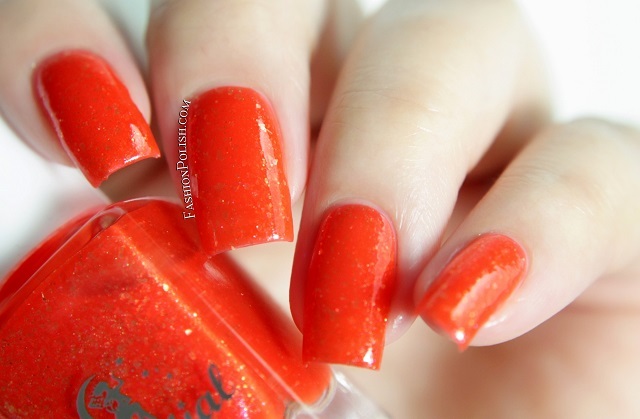 Set You Free is a vivid orange filled with red shimmer, gold flakes and iridescent micro glitters. Lady is an antique rose crelly with a pink flash and blue/purple microshimmers. We Are Band Aids is a purple linear holo with pink shimmer and red micro particles. Does Anybody Remember Laughter is a periwinkle crelly with a purple shimmer and icy blue microglitters. Like I said, this is my first trying Celestial and I have to say that I really enjoyed them, especially the pigment/shimmer/glitter/holo mixes perfect balance. My favorites : Lady, Set You Free, We Are Band Aids and Does Anybody Remember Laughter. 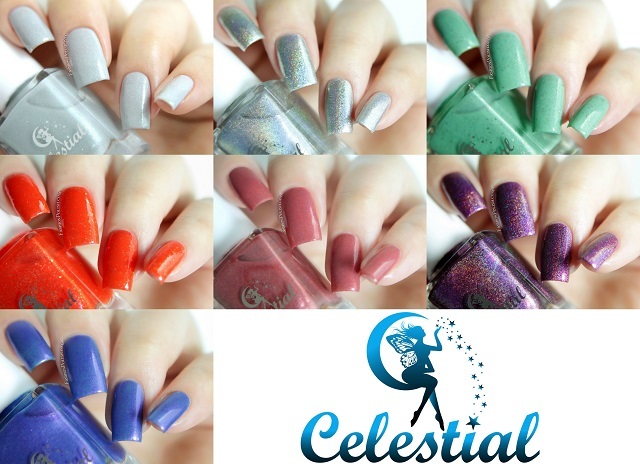 I received the Celestial Cosmetics It's All Happening collection from Color4Nails.com, where they retail for $11 each (international shipping available).